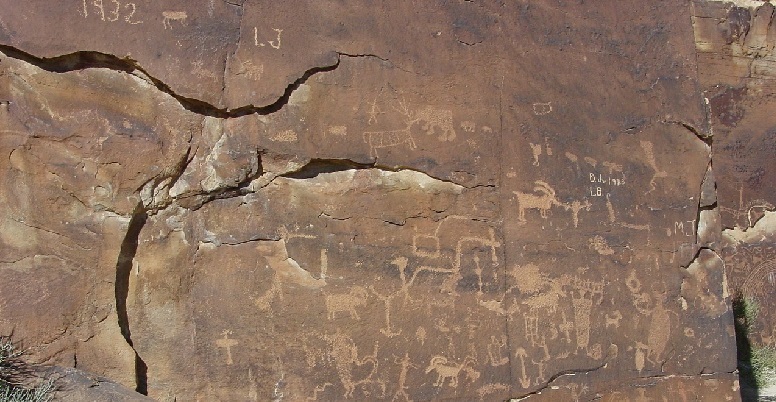 Nine Mile Canyon, often promoted as “the world’s longest art gallery” because of its extensive rock art and rich archaeological history, sits in eastern Utah, south of Vernal and north of Moab. Like other desolately beautiful, mineral rich areas of the state, it has found itself a focal point of tension between those who would preserve it as-is and those who would use it for more recreational and economically-advantageous activities. Jerry Spangler is the the executive director of the Colorado Plateau Archaeological Alliance and was previously an environmental reporter for the Deseret News. He is also the author of several books and reports including Nine Mile Canyon: The Archaeological History of an American Treasure and Horned Snakes and Axle Grease. He graduated in 1993 with a Master’s of Arts in Anthropology from Brigham Young University. His wife Donna obtained a Bachelor’s in Communications from the University of Portland. She is currently employed as the Public Information Officer/Communications Director at the Utah Department of Environmental Quality. She was previously a reporter for Deseret News and a senior reporter for Exchange Monitor Publications, Wash. D. C. Donna coauthored Last Chance Byway: The History of Nine Mile Canyon and Horned Snakes & Axle Grease with her husband. Founded in 1972, the Charles Redd Center for Western Studies came about because of growing ethnic studies: “ New areas of study included Mormon, women’s, African American, Chicano, and Native American studies. Scholars interested in those fields created new professional organizations, journals and conferences.” BYU’s research center was formed when history professors petitioned the administration for the center so as to: “promote and enhance western studies on the campus.” The center hosts six programs, a few of which are the Western Studies Minor,the Oral History Program, and K-12 History of the West Lesson Plans. In the coming months, be sure to keep in the mind the Charles Redd Center’s upcoming events: Benjamin Madley: An American Genocide: The United States and the California Indian Catastrophe and the annual Annely Naegle Redd Lecture presented by David Wrobel on John Steinbeck’s effect on the country and his representation of Western America. According to Dr. Brenden Rensink of the BYU History Department, this event is intended for everyone, not just BYU students. For those not able to attend in person, the presentation will be live streamed online here. Have You ever been to Nine Mile Canyon?